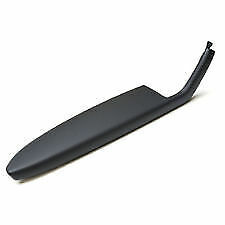 New genuine Audi A3 3 door n/s passenger front door armrest in black leather. Fits Audi A3 from 2003-2013. Cardiff Audi. 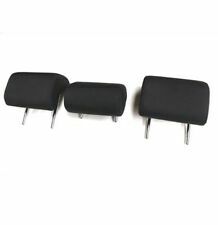 New genuine Audi A3 o/s drivers front door armrest in black leather. Fits Audi A3 from 2003-2013. Cardiff Audi. Genuine Audi Part. To suit 3 door models only 2003-12. PART NUMBER 4E0885921D22A CA23. 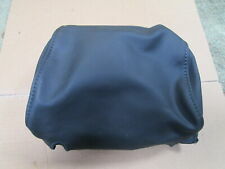 IT IS A FRONT / REAR SEAT HEAD REST COVER IN VALCONA LEATHER THE COLOUR IS BLACK. RRP £326.17 FROM AUDI. Manufacture Part Number 8P3867174. Note - AUDI A3 P8 (2003-2012)NOTE: PART FITS 3DOOR CARS ONLY. NS is Nearside, Left, or the passenger side in the UK. AUDI A3 MK3 8V 2013-2017 S-LINE BLACK LEATHER DRIVER RIGHT FRONT HEADREST WITH WHITE STITCHING. OS is offside, right, or drivers side in the UK. AUDI TT Mk2 8J 2008. AUDI TT COUPE 2008. GENUINE RIGHT DRIVER DOOR ARMREST. Audi parts available off the shelf. NS is Nearside, Left, or the passenger side in the UK. OS is offside, right, or drivers side in the UK. IT IS THE RIGHT CENTRE ARM REST LOWER PART IN SWING DARK GREY VALCONA LEATHER. LAST RRP £413.46 FROM AUDI. NS is Nearside, Left, or the passenger side in the UK. All Parts have been checked and are in good working order. OS is offside, right, or drivers side in the UK. Be sure to add Nirro to your favourites list ! NS is Nearside, Left, or the passenger side in the UK. AUDI A5 2008-ON BLACK DRIVER RIGHT FRONT LEATHER HEADREST WITH WHITE STITCHING. We won’t take any responsibility for the compatibility of parts unless we have explicitly said it will fit. NS is Nearside, Left, or the passenger side in the UK. We won’t take any responsibility for the compatibility of parts unless we have explicitly said it will fit. All Parts have been checked and are in good working order. AUDI A3 8P7 2010. RIGHT DRIVER INNER DOOR ARMREST HANDLE BLACK. Audi parts available off the shelf. NS is Nearside, Left, or the passenger side in the UK. OS is offside, right, or drivers side in the UK. NS is Nearside, Left, or the passenger side in the UK. AUDI Q7 4L. REAR RIGHT DRIVER SIDE DOOR ARMREST HANDLE BLACK LEATHER. OS is offside, right, or drivers side in the U K. An item that has been previously used. (RIGHT HAND DRIVE MODELS ONLY) BUT CAN VARY ! IT IS THE RIGHT CENTRE ARM REST UPPER PART IN LEATHER THE COLOUR IS CARDAMOM BEIGE. RRP £151.03 FROM AUDI. PART NUMBER - 8P3867374A. NS is Nearside, Left, or the passenger side in the UK. AUDI A3 8P1 2012 3 DOOR. AUDI A3 8P1 2012 SE. REAR LEFT & RIGHT SIDE QUARTER PANEL ARMREST LEATHER. 3 DOOR BLACK / LZ9Y -PHANTOM BLACK. AUDI A3 P8 (2003-2012). FOR SALE IS A NEW GENUINE RIGHT O/S DOOR CARD BLACK ARMREST TO FIT Part number. Removed from a 2012 Audi A1 1.6 Tdi (2010 onwards) 3 door hatchback only 48,156 recorded miles. Model - Audi A1 (3 door). Fuel type - Diesel. Year - 2012. PART NUMBER 8P0885901AC66T 42. NO LONGER AVAILABLE FROM AUDI. LAST RRP £197.54 FROM AUDI. IT IS THE LEFT OR RIGHT REAR SEAT HEAD REST, THE COLOUR IS LIGHT PLATINUM GREY. MODEL: AUDI A3 8P 2.0L FSI 2004 3 DOOR-. -INTERIOR CODE COLOUR: INDIGO BLUE-. -PAINT COLOUR: KRYSTALL/CRYSTAL BLUE-. Security marked with a coloured marker signature and or usually a sticker. -PAINT CODE LY7R-. MODEL: AUDI A3 8P 2.0L FSI 2004 3 DOOR-. FITS ALL MODELS OF AUDI A3 other models of Audi. Security marked with a coloured marker signature and or usually a sticker. -INTERIOR CODE COLOUR: BLACK LEATHER -. (RIGHT HAND DRIVE MODELS ONLY) BUT CAN VARY ! IT IS THE LEFT CENTRE ARM REST UPPER PART IN LEATHER THE COLOUR IS BLACK. RRP £128.90 FROM AUDI. We are Breaking a 2004 Audi A3 Sport Fsi 8P Mk2 (Pre-Facelift). Shelf Location: HEADREST B. 2.0L (1984cc) Petrol 150Bhp 3Door Hatchback 6 Speed Manual RHDAir Con: Yes. Wing Mirror Type. Screws, nuts and bolts are also classed as a free gift if included. NS is Nearside, Left, or the passenger side in the UK. OS is offside, right, or driver’s side in the UK. All Parts have been checked and are in good working order. Be sure to add Nirro to your favourites list ! AUDI TT MK2 07-10. AUDI TT MK2 2007. DRIVER DOOR INTERIOR ARMREST HANDLE BLACK LEATHER. NS is Nearside, Left, or the passenger side in the UK. OS is offside, right, or drivers side in the UK. An item that has been previously used. AUDI A3 S3 RS3 MK2 8P 2005-2012 SPORTBACK REAR RIGHT DOOR INTERIOR HANDLE ARMREST IN GOOD USED CONDITION. WILL FIT 4 DOOR SPORTBACK ONLY. UK - NORTHERN IRELAND, SCOTLAND, HIGHLANDS, ISLANDS ETC. Donor Car: 2005 Audi A3 8P Sportback 1900cc. The New and Used Audi Parts Specialist for all Audi models worldwide. Donor Car Colour: Bodywork is Grey LZ7L. Interior trim is N7A/ MD. It may fit others. AUDI A3 8P 3DOOR 03-12 GENUINE BLACK LEATHER PASSENGER LEFT NS DOOR CARD ARMREST. Excellent condition like new. MODEL: AUDI A3 8P 2.0L FSI 2004 3 DOOR-. Security marked with a coloured marker signature and or usually a sticker. -INTERIOR CODE COLOUR: INDIGO BLUE-. -PAINT COLOUR: KRYSTALL/CRYSTAL BLUE-. -PAINT CODE LY7R-. BOTH FRONT SEAT HEADREST INDIGO BLUE. AUDI A3 2005. We also specialise in used car parts that have already been removed and shelved. WE AIM TO PUT DOWN AS MUCH INFORMATION AS POSSIBLE AND BE ACCURATE AS POSSIBLE IN DESCRIBING THEM ANY PROBLEM WILL BE LISTED OR SHOWN IN PICTURES. Donor vehicle: Audi A3 8V 2014 S Line Sportback. For Right Hand Drive vehicles only, due to single switch being attached. Arm rest in black. ARM REST BLACK. No DIY or amateours asking for advice and expecting fast miraculous fix! NS is Nearside, Left, or the passenger side in the UK. OS is offside, right, or drivers side in the UK. Be sure to add Nirro to your favourites list ! We won’t take any responsibility for the compatibility of parts unless we have explicitly said it will fit. NS is Nearside, Left, or the passenger side in the UK. OS is offside, right, or drivers side in the UK. Be sure to add Nirro to your favourites list ! IN ALL CASES WE STATE THE CONDITION OF OUR PARTS. VAG PART NUMBER: 8P3867373A. AUDI A3 MK2 8P 3DR BLUE LEFT SIDE REAR DOOR CARD ARMREST IN GOOD USED CONDITION. UK - NORTHERN IRELAND, SCOTLAND, HIGHLANDS, ISLANDS ETC. We are Breaking a 2006 Audi A6 Avant SE 4F C6 (Pre-facelift). Shelf Location: HEADREST D. Paint Colour: Brilliant Black. 2.0L TDI (1968cc) Diesel 140Bhp 5 Door Estate 6 Speed Manual RHD Air Con: Yes. Wing Mirror Type. NS is Nearside, Left, or the passenger side in the UK. AUDI A8 4E. REAR RIGHT DRIVER SIDE DOOR ARMREST BLACK LEATHER. OS is offside, right, or drivers side in the U K. PART NUMBER -. An item that has been previously used. Donor Car: 2006 Audi A4 B7 S Line 2000cc. The New and Used Audi Parts Specialist for all Audi models worldwide. Audi Part Number: 8E0 867 374. It may fit others. PART NUMBER - 4E0867174. NS is Nearside, Left, or the passenger side in the UK. AUDI A8 4E. FRONT RIGHT DRIVER DOOR ARMREST BLACK LEATHER. We won’t take any responsibility for the compatibility of parts unless we have explicitly said it will fit. Part number: 4F0819383A. We are Breaking a 2006 Audi A6 Avant SE 4F C6 (Pre-facelift). Screws, nuts and bolts are also classed as a free gift if included. 2.0L TDI (1968cc) Diesel 140Bhp 5 Door Estate 6 Speed Manual RHD Air Con: Yes. We are Breaking a 2006 Audi A6 Avant SE 4F C6 (Pre-facelift). Shelf Location: HEADREST D. 2.0L TDI (1968cc) Diesel 140Bhp 5 Door Estate 6 Speed Manual RHD Air Con: Yes. Paint Colour: Brilliant Black. Donor Car: 1997 Audi A8 D2 PF 2800cc. Donor Car Colour: Bodywork is Grey LYZL. Interior trim is Grey N3Q/ BV. The New and Used Audi Parts Specialist for all Audi models worldwide. It may fit others. NS is Nearside, Left, or the passenger side in the UK. AUDI A3 8P1 2012 3 DOOR. AUDI A3 8P1 2012 SE. REAR LEFT & RIGHT QUARTER ARMREST BLACK LEATHER. 3 DOOR BLACK / LZ9Y -PHANTOM BLACK. parts available off the shelf. Fits following: B6 B7. Audi A4 B6 front seat headrest in black leather - right. We aim to provide very highest levels on all our services. Part origin: genuine part. Includes: pictures of actual part.